After 5 days of hamburger heavy metal madness in New York City with the guys from Grill ‘Em All Truck, winners of The Food Network’s “Great Food Truck Race,” how did we celebrate? 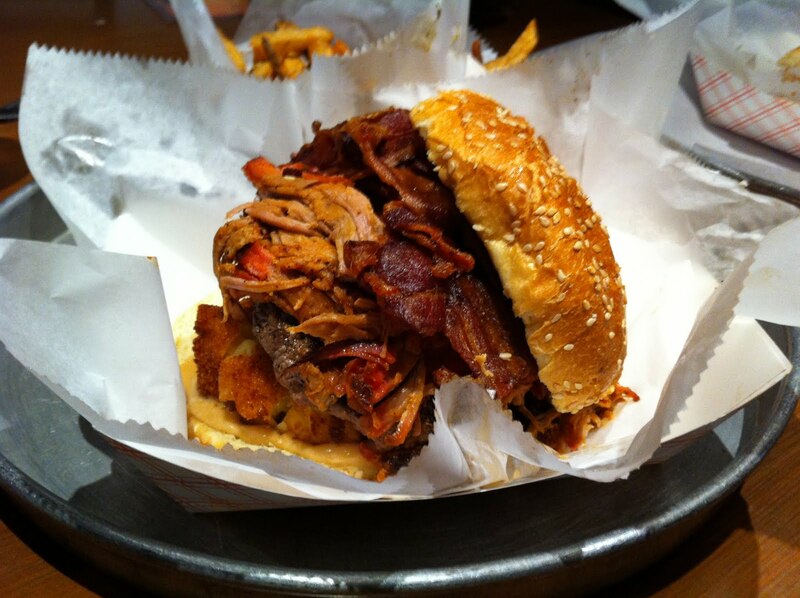 The guys asked me to take them for the best burger in NYC and for that, there is only one place you can go, Rub BBQ. But let’s get back to that in a New York minute. Only two days prior, we had taken over the kitchen at Rub on the Grill ‘Em All Truck’s “Victory Lap,” a thank you to the fine city that made the victorious. Out of 8 kitchen take overs in 4 days, the lunch service at Rub was the only location where the guys served their limited edition “Pantera Burger.” This intense creation was made by stacking a brick of fried macaroni and cheese, Grill ‘Em All’s signature garlic aioli, a “NY Blend” beef patty from Burger Maker Inc, crispy bacon and a 3rd pound of Rub BBQ’s famous pulled pork in between an artisan sesame seed brioche. As the Pantera was being served and patrons stomachs were being moshed by this Texas Cowboy from Hell, all we were saying back in the kitchen was “we need to come back here on Monday and eat the Rub BBQ secret menu burger! !” Yup, only we are crazy enough to celebrate an amazing burger party with a burger. 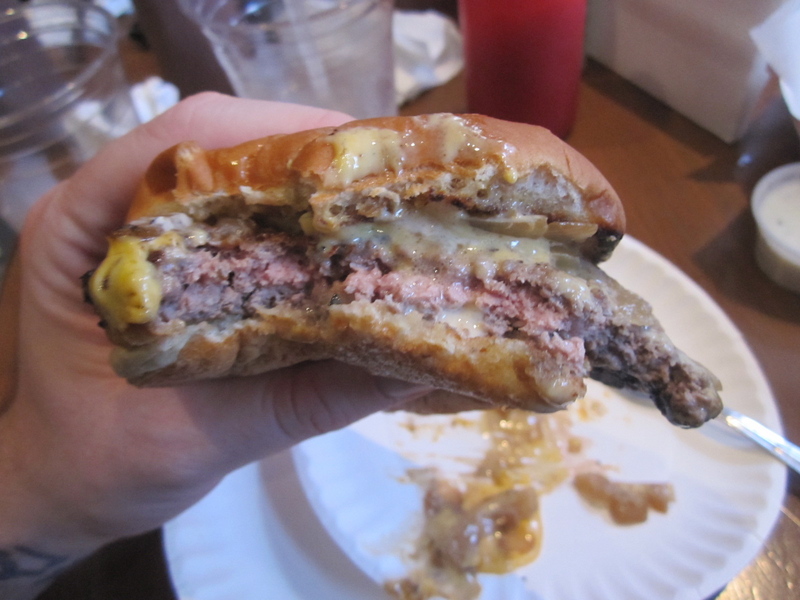 But to be honest, the Monday Night Burger“ tradition at Rub is, in my opinion, the finest in all the land. You see, every Monday, starting at 6 pm Rub owner Andrew Fischel and Chef Scott Smith unleash their burger love by offering a limited amount of 2 different burgers; 1. The Monday Night Rub Secret Burger, a secret blend of in-house ground beef, cooked smashed style, with grilled onions, small pickle slices, a slice of Velveeta cheese and the chipotle based special sauce burger served on a buttered and grilled bun and 2. The weekly special, which in this case was the infamous Giovanni Burger! Made famous by Ritzy Lunch in Clarksburg, WV, the Giovanni burger is served with fresh mozzarella and roasted red peppers served between two pieces of thick, buttered, garlic toast. If you love burgers, do not miss out and you will experience what I promised Grill ‘Em All, a delicious burgery adventure. I make jokes about it all the time but it’s true, if you are friend to Andrew he shows you his love and appreciate by attempting to murder you with meat. I don’t care how hungry I am or how much I attempt to control my ordering at Rub, it simply can not be done. Trying to eat light here is the equivalent of banging one’s head against a BBQ smoker. This meal, like every other one I have had here, started exactly the same, with enough food to feed a Roman army. After platefuls of their AMAZING BBQ pastrami, hot wings, BBQ bacon, Frito Pie and whatever the hell else was thrown at us, we still had 2 burgers to rifle through. We started with the traditional Rub BBQ burger namesake and it was delicious as always! For my full review on the burger, click here. After devouring the delicious treat, we all had to step outside for fresh and air, and for some, a cigarette. Yes, it’s that damn good. With the clock ticking before they had to get on their flight, Chef Scott emerged from the food laboratory known as Rub’s “kitchen” with platefuls of Giovanni Burgers. Using fresh Italian bread from the Wholefoods Market only 2 blocks away, Scott slices the bread into thick pieces before covering them in a garlic butter and then toasting it. It’s then piled with the signature Rub burger patty, red peppers that Rub roasted only 60 minutes prior and a slice of finely made mozzarella cheese. Once hot, the cheese melts down to a thick chewy cloud. The peppers taste as though they were pulled from a garden that afternoon, something you wouldn’t expect to find at BBQ restaurant but that is why they should never be underestimated. The meat is so well seasoned and made from such an amazing cut that all you get is natural beef taste and so little saltiness, leaving that sensation up to the command of the garlic toast. While you won’t be able to get one for yourself as Rub changes the special every single week, I am sure whatever they are serving when you do stop in, will be amazing. Hopefully you won’t go there, like we did, after 5 days straight of eating burgers! Bang your head, hamburgers will drive you mad! This entry was posted in Uncategorized and tagged the great burger conquest hamburger cheese best review new york nyc ny rub bbq fischel grill em all truck pantera victory lap giovanni ritzy lunch. Bookmark the permalink.